Château Maylandie is situated in the heart of the region Corbières (the area of the Cathars religion & the crusades). It has belonged to the family Maymil for more than half a century. In the last twenty years, the planted grape varieties have been improved and the winery and aging-cellar have been modernised while respecting the wine-making tradition. In 1975, his son, Jean Maymil (1947), decided, with his wife Anne-Marie, to put a lot into the family’s wine estate which counted 30 hectares of vineyards. 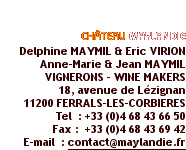 In 1987, only two years after the establishment of AOC Corbières by the INAO, Jean Maymil decided to create his own winery in order to sell his production on his own brand: “Château Maylandie”. The name Maylandie is derived from the union of the names of Maymil and Landrodie, his wife’s maiden name. At the same time, he pulled up wide-yield grape varieties and planted grape varieties such as Grenahe Noir on a sunny hillside. Since 1999 he has engaged himself in "Ecological Agriculture» under the labels “Agriculture Raisonnée” and VITEALYS, in order to express its respect for the environment and consumer. He belongs to “Vignerons Indépendants” association. "The appellation CORBIERES is the biggest wine area of Languedoc..."
The appellation CORBIERES is the biggest wine area of Languedoc and it is split into 9 terroirs. It’s principally on the terroir of Boutenac, which is renowned for producing very good wines thanks to the terroir (pebbly-chalky-clayey soil and Mediterranean climate), that are planted the 20 hectares of Château Maylandie’s vines. Château Maylandie has the particularity to have more Grenache Noir than Carignan as it is used to be in the Corbières. Besides these two grape varieties, Château Maylandie also has Mourvèdre, Syrah, Cinsault, Grenache Blanc and Bourboulenc, giving exquisite aromas of red or white fruits and spices.